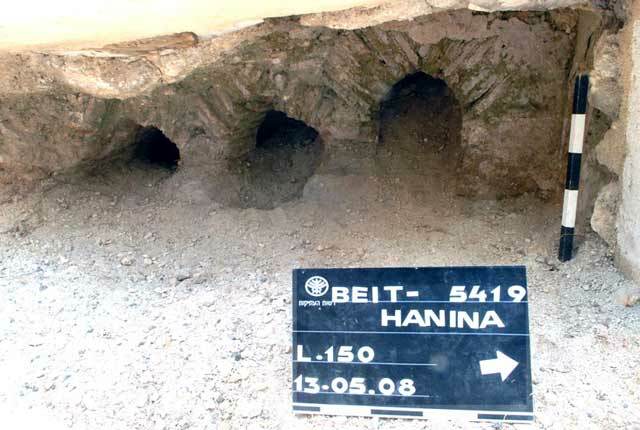 During August–September and December 2007 and January and April 2008, four excavation seasons were conducted in the Beit Hanina neighborhood of Jerusalem (Permit Nos. A-5194, A-5419; map ref. 22157–8/63738–41), prior to development. The excavations, undertaken on behalf of the Israel Antiquities Authority and underwritten by the Moriya Company, were directed by Z. ‘Adawi, with the assistance of R. Abu Halaf, Y. Ohayon and N. Sanduka (administration), A. Nagar and D. Levy (GPS), A. Hajian, M. Kunin and T. Kornfeld (surveying and drafting), T. Sagiv (field photography), B. Touri and C. Masarwa (antiquities inspection), R. Bar Natan (ceramics), C. Hersch and I. Lidski-Reznikov (pottery drawing), Y. Kupershmidt (metallurgical laboratory), D.T. Ariel and G. Bijovsky (numismatics), and T. Adakidak (Yahal Engineering Company). 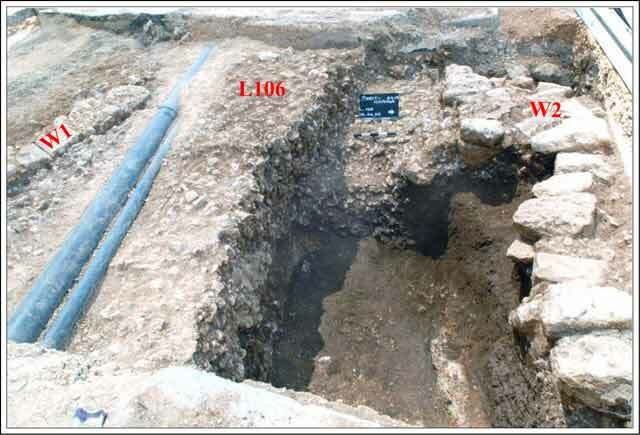 Two excavation areas were opened c. 30 m apart, one on Tahah Hussein Street (Area A; 85 sq m; Permit No. A-5194) and the other on ‘Abd Al-Hamid Shuman Street (Area B; 55 sq m; Permit No. A-5419; Fig. 1). The two excavation areas were situated on leveled ground where the Roman road from Jerusalem to Lod (the Bet Horon road) passed. This road branched off from the longitudinal Roman road that ran from Jerusalem to Nablus. Segment remains of this lateral road are visible on the surface for a distance of c. 240 m, just north of the excavation areas (Fig. 2). Another segment of this road was excavated in 2004 c. 150 m north of this section (HA-ESI 120). 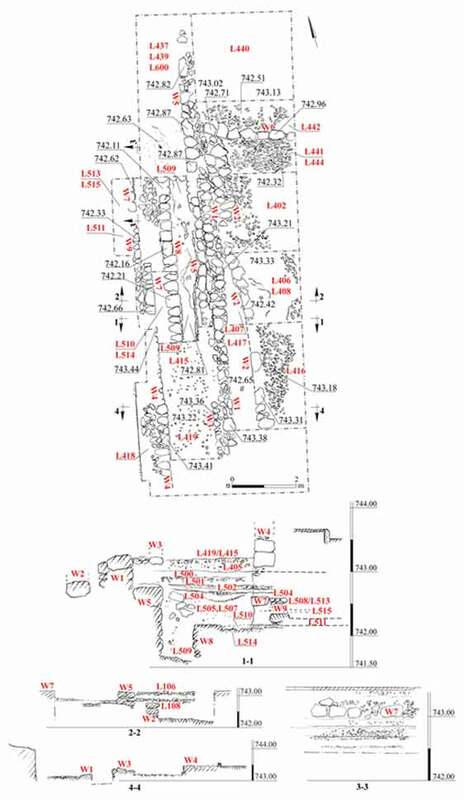 The excavation areas are c. 200 m north of Khirbat Hawanit, where settlement remains from the Roman and Byzantine periods had previously been exposed (HA-ESI 119). 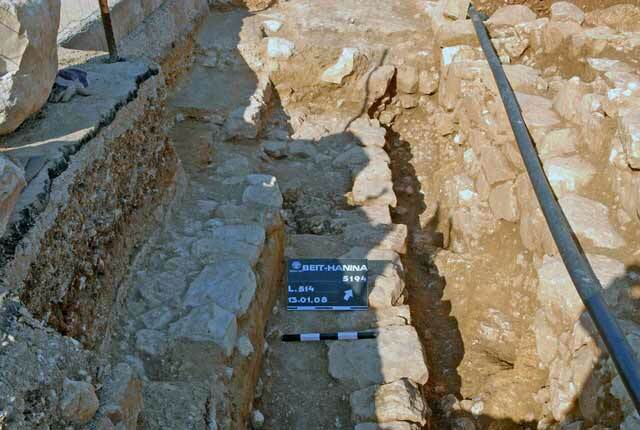 Two farming terrace walls and a section of the ancient lateral road that dated from the end of the Hellenistic to the Byzantine periods, running from Jerusalem to Lod, were exposed in Area A. 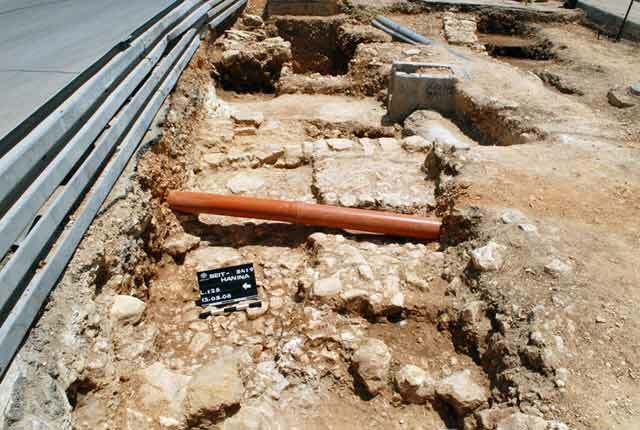 Two sections of ancient roads that are contemporaneous with the road in Area A were discovered in Area B; one of these two sections is part of the Jerusalem-Lod lateral road. Remains of a bathhouse were exposed and a sarcophagus was documented just south of Area B, within the confines of the Rosary Sisters School (Rahaba’at al-Wardiya). Farming Terrace Walls. Two farming walls (W2, W6) were exposed in the eastern part of the area. 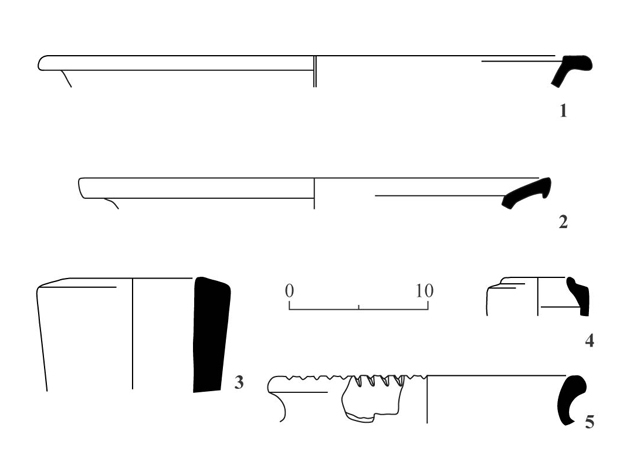 Wall 2 (exposed length 6 m), aligned north–south and preserved two courses high, was built of one row of medium-sized fieldstones (Fig. 4). The wall was founded on a layer of very small stones above the bedrock that descends to the west. Two levels of small fieldstones (L402, L406, L416; each 0.15 m thick) placed on dark brown terra rossa silt (L408) were exposed on the eastern side of the wall. Wall 6, oriented east–west, was built of medium fieldstones (Fig. 5). It was founded on alluvium that had accumulated on the bedrock. It seems that the two walls were built at the same time. They were severed by one of the road phases and it therefore seems that they predated the road. An Ancient Road. Walls that delimited an ancient road (W1, W3–W5, W7–W9) and the road surfaces were exposed slightly west of the farming terrace walls. Seven phases (1–7) were discerned in the road remains, most of them built one atop the other, with slight shifts in their location. Each new constructed phase utilized the phase beneath it as a foundation. A wall (W8) and a nearby road surface to its west were built in the earliest Phase 1 (Fig. 6). The road surface consisted of two layers, the upper one was a thin yellow colored chalk (L510) and the bottom was composed of small and medium fieldstones (L514). A wall (W9) and a road surface to its west (Fig. 7) were built in Phase 2, west of the Phase 1 road. The road surface consisted of two layers (upper—L511; lower—L510), both of thin pale yellow chalk. The bottom layer abutted the top of W8; this layer served as the upper layer of Phase 1, as well as the bottom layer of Phase 2. A coin dating to the reign of Emperor Tiberius (first century CE; IAA 120173) was discovered in the fill of the upper layer (L511). A new wall (W7) was built next to the eastern side of W9 and a road surface was built west of W7 in Phase 3. The road surface consisted of two layers, the upper one (L508/L513) of small stones and coarse light brown gravel, and the lower one of thin chalk (L515) placed on top of a road’s segment from Phase 2. A wall (W5) was built and a road surface was constructed to its west in Phase 4. The surface was built of two layers, the upper one of dark brown soil (L504) and the lower one was yellowish sandy soil (L505, L507). A krater dating to the Byzantine period was discovered (Fig. 8:1) in the upper layer; a jar from the Herodian period (Fig. 9:4) and a coin that dated to the end of Alexander Jannaeus’ reign or later (IAA 120171) were discovered in the lower layer. A cooking pot from the Herodian period (Fig. 9:3) and a coin from the reign of the emperor Nero (58/9 CE; IAA 120172) were discovered in the foundation trench of W5 (L509). 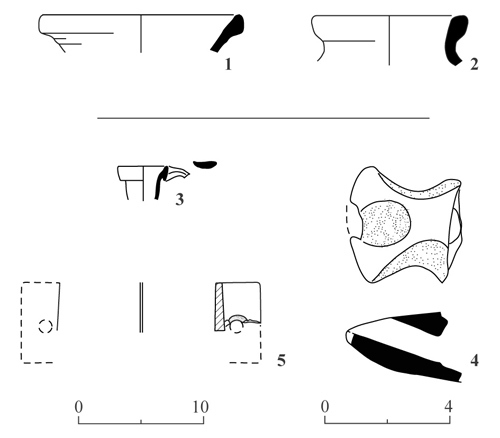 In the fill that covered W5 (L600) ceramic finds from the Herodian period were discovered, including a bowl (Fig. 9:2), a jug (Fig. 9:5) and a lamp (Fig. 9:6). A road surface that probably did not have an enclosure wall was built in Phase 5. The surface consisted of two layers: an upper one of gray soil and small stones (L501) and a lower one of brown soil and very small stones (L502). A wall (W1) and a road surface were built in Phase 6. The surface was composed of three layers; the upper one consisted of brown soil (L405), the middle was brown-gray soil (L500) and the lower layer comprised gray soil and small stones (L501). Several stones that might belong to the road pavement of this phase were exposed next to W1. A road (width 1.5 m) was constructed in the latest phase, Phase 7. It was delimited by two walls (W3, W4; Fig. 10). The walls were built of small and medium fieldstones. The road surface (L415, L419) consisted of very small fieldstones, placed on a layer of dark brown soil (L405). It seems that in this phase the road was narrower and became an alley or a narrow field lane. This road was used in the final phase of the site’s use. The ceramic finds discovered in the fill of the road surface included a bowl (Fig. 9:1) from Iron Age II, kraters (Fig. 9:7, 8) and jars (Fig. 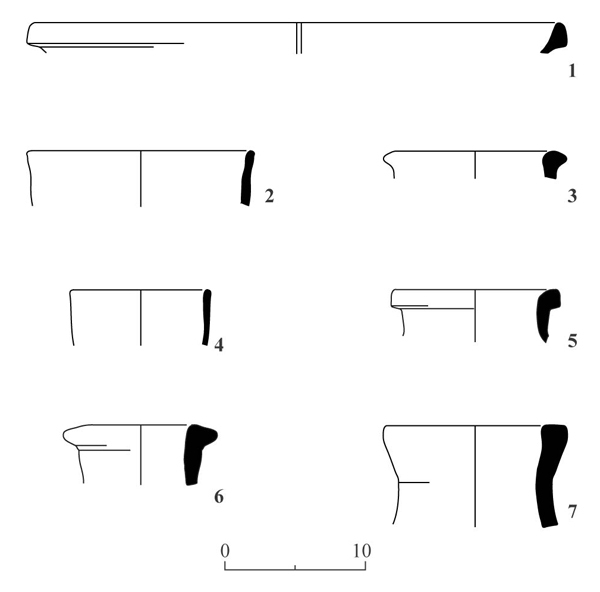 9:9–11) from the Late Roman period (second–third centuries CE), as well as bowls (Fig. 8:2), kraters (Fig. 8:3), a jar (Fig. 8:4) and a roof tile (Fig. 8:5) from the Byzantine period. The latest finds evidently date the periods when the road was used. Segments of two roads (Fig. 11) were exposed; one was aligned east–west and the other—north–south. The latter is the continuation of the lateral Jerusalem-Lod road that was exposed in Area A. The East–West Aligned Road (Fig. 12). The level of this road was higher than that of the other road. 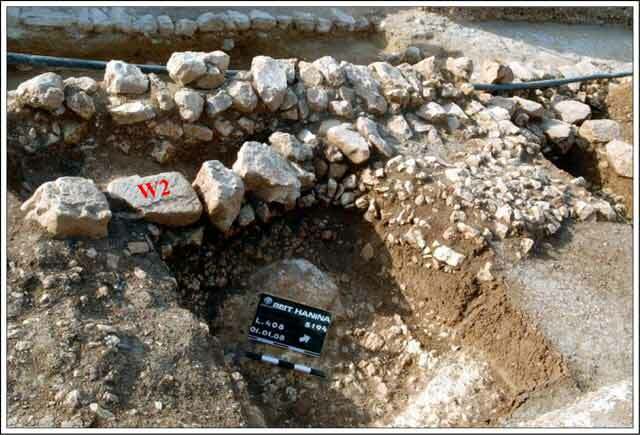 Two enclosure walls (W1, W2) and the road surface between them were exposed. The walls, built of different size fieldstones, were adjoined by a thick road surface composed of very small stones (L106, L111; height c. 1.3 m) that was founded on top of the bedrock. Finds discovered in the road surface included a cooking pot (Fig. 13:2) dating to the second century CE and jars (Fig. 14:3, 5) dating from the second century to the mid-fourth century CE, as well as three coins, two of which are silver Roman republican coins (second–first centuries BCE; IAA 123171, 123172; Fig. 15:1, 2) and one coin dating to the years 18/19 CE (IAA 123170). Fragments of pottery vessels were discovered in the fill that covered the road, among them a lamp (Fig. 16:4) and a measuring cup (Fig. 16:5) from the Herodian period, a cooking pot (Fig. 13:1) and jar (Fig. 13:3) from the second century CE, bowls (Fig. 14:1, 2) and a jar (Fig. 14:7) from the second century to the mid-fourth century CE and a krater (Fig. 17:2) from the Byzantine period. The North–South Aligned Road (Fig. 18). This segment, like the segment of the road exposed in Area A, had several construction phases. An enclosure wall (W6) and a road surface to its west were built in the earliest Phase 1. The road surface consisted of a soil level and very small fieldstones (L127). Only two stones were preserved of W6. An enclosure wall (W3) and a road surface to its east were built in Phase 2. 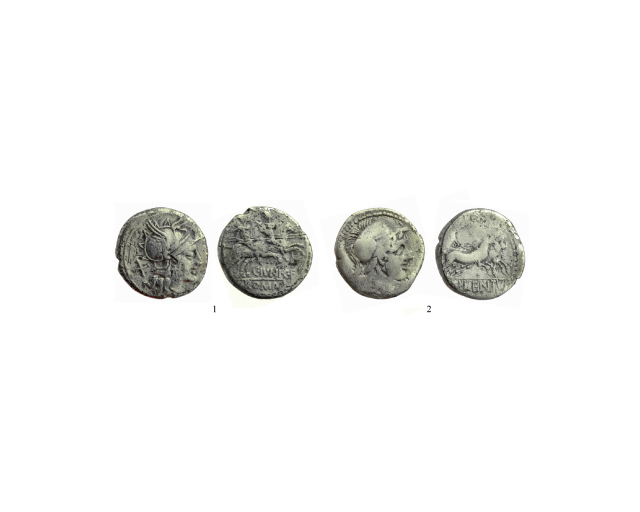 The road surface consisted of light brown earth and very small fieldstones (L129); it contained two coins, one from the year 30/1 CE (IAA 123176) and another from the year 54 CE (IAA 123177). An enclosure wall (W5) was built in Phase 3 beneath W3 and a road surface of very small fieldstones (L132) was placed west of it. Road surfaces were built west of W3 in the three upper phases (4–6). It seems that W3 was used to delimit the road surfaces in the three phases. The width of the road surfaces is unknown because the enclosure wall on the western side was not discovered. The road surface in Phase 4 was built of earth and very small fieldstones (L123); it contained a coin dating to the Great Revolt (IAA 123174). The road surface in Phase 5 was built of very small stones (L125, L130); it contained a coin from the year 58/59 CE (IAA 123178). The road surface in Phase 6 was built of small fieldstones (L128); it contained fragments of pottery vessels from the Herodian period, including an ungentarium (Fig. 16:3). Soil fill overlying the road remains contained jars from the Hasmonean period (Fig. 16:1, 2), a jar from the second century CE (Fig. 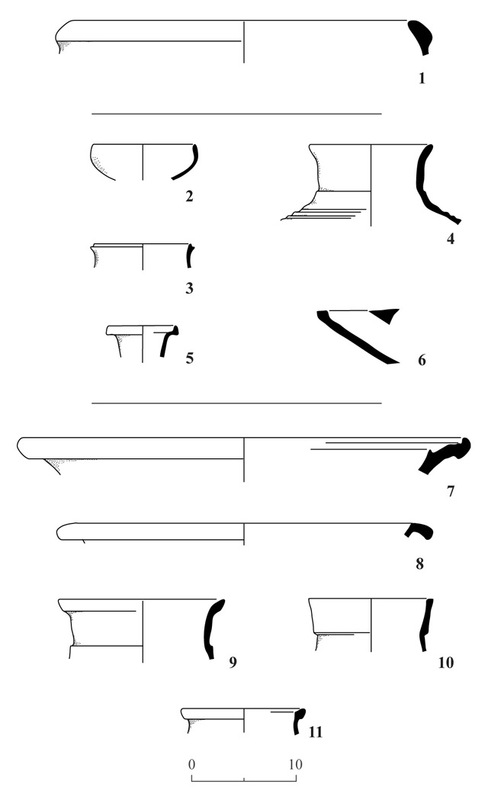 13:4), jars from the second century to the mid-fourth century CE (Fig. 14:4, 6) and a fragment of a roof tile (Fig. 17:3) and a pipe (Fig. 17:4) from the Byzantine period. Bathhouse. Two rows of colonnettes were discovered in the southwestern corner of the schoolyard (map ref. 637250–5/221570–5); these supported the floor of a caldarium (Figs. 19, 20). 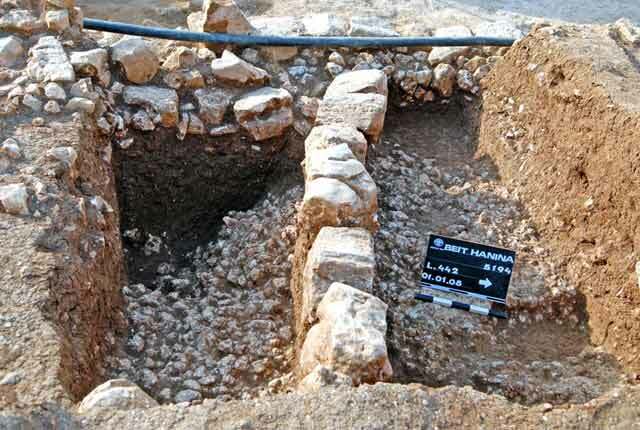 Other remains of the colonnettes continued toward the west beneath the western wall of the school and below Ta’hah Hussein Street, in the direction of Khirbat Hawanit. Arches were built on the upper part of the colonnettes; both colonnettes and arches were built of square clay bricks bonded with gray mortar. A bowl fragment from the Byzantine period (Fig. 17:1) and a bowl fragment from the Early Islamic period (Fig. 17:5) were discovered in the soil exposed between the colonnettes. Presumably, the bathhouse was part of nearby Khirbat Hawanit. Sarcophagus (Fig. 21). The sarcophagus is standing at the front of the school and the location of its discovery is unknown. It was hewn from a single large block of limestone (length 2.1 m, width 0.77 m, height 0.92 m, wall thickness 0.12 m). Two crescents with two circles within them are carved in the front long side. The sarcophagus is presumed to have been originally discovered at Khirbat Hawanit. 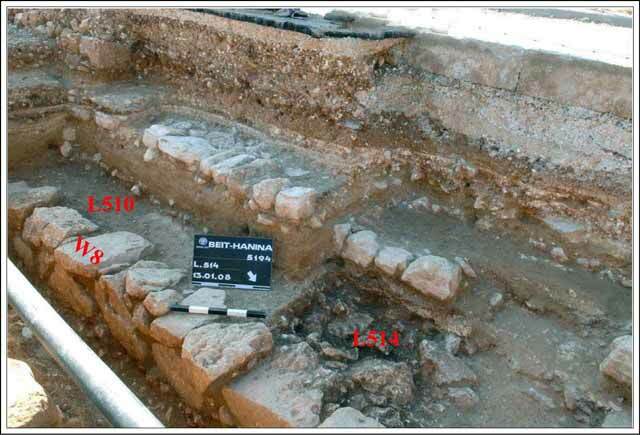 The small-scale excavations were conducted along the shoulders of modern streets and therefore some of the roads discovered in the excavation were not exposed for their entire width. The construction of the roads, the different phases discerned in two of the segments, and the variety of ceramic finds and coins all show that the roads were used for a very long time and their construction was a public-work project. With the exception of a single body sherd from the Iron Age, the ceramic finds and coins range in date from the end of the Hellenistic until the Byzantine periods. These finds probably indicate that the beginning of the roads in the region was in the Late Hellenistic period, in the first century BCE. In the Early Roman period the roads were renovated or rebuilt as part of an imperial project and in the Late Roman and Byzantine periods they were maintained as part of their ongoing use. 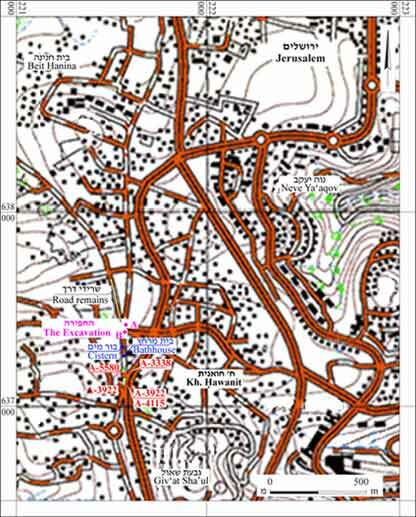 There is evidence in historical sources that refers to the paving of the roads around Jerusalem at the time of the Great Revolt and the Bar Kokhba Revolt, as part of a Roman project to renovate existing roads and build new ones as a step in conquering Judea and Jerusalem and furthering Roman control over this region (Y. Roll. 1976. The Roman Road Network in Eretz-Israel. Qadmoniot 9:40 [Hebrew]; M. Avi-Yonah 1984. The Holy Land: A Historical Geography from the Persian to the Arab Conquest (536 B.C. to A.D. 640). Jerusalem. P. 81[Hebrew]). There is also some fragmentary information in the works of Josephus and in the New Testament (M. Fischer, B. Isaac and I. Roll. 1996. Roman Roads in Judaea II. The Jerusalem–Jaffa Roads [BAR Int. S. 628]. Oxford. Pp. 8–19) about the roads that were used prior to the Roman period. 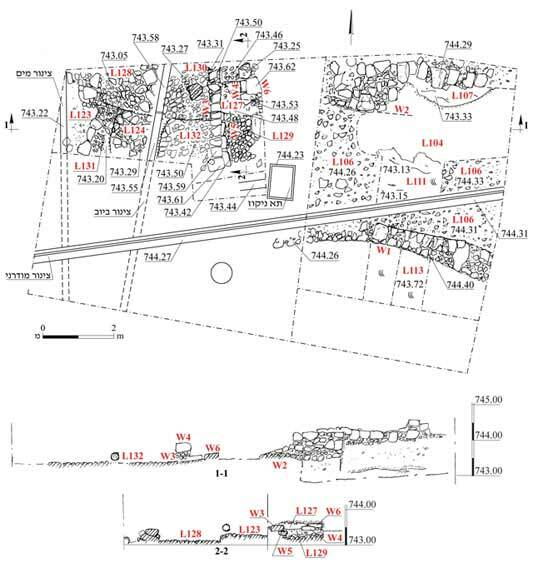 The rehabilitation and renovation of the roads during the Roman period make it difficult to identify their previous phases, both in surveys and in excavations. 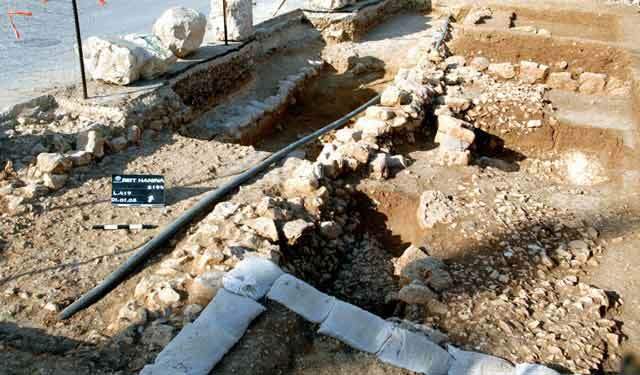 The current excavation exposed two segments of the lateral road, referred to as the Bet Horon Road, as well as the Jerusalem-Lod road or the Modi‘in-Bet Horon road. Josephus called it the “Public Road”. The historical sources frequently refer to it as a direct transportation artery that linked Jerusalem to Yafo and the coastal plain. 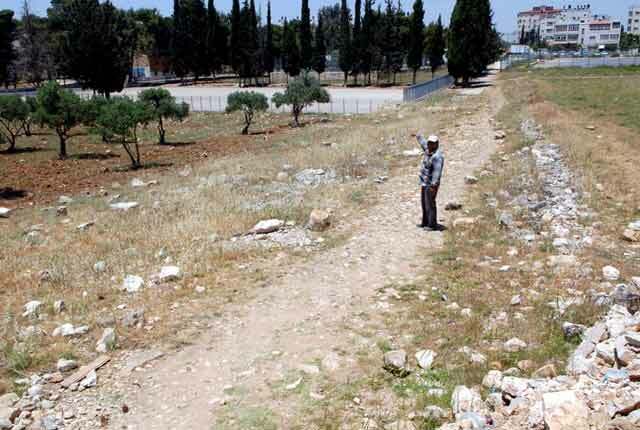 The road branched off from the Jerusalem–Nablus longitudinal road that ran through the hill country in the vicinity of Tell el-Ful (Giv‘at Sha’ul) and Khirbat Hawanit, near the excavation area (Survey of Jerusalem, the Northeastern Sector, Sites 28, 79). The road continued from there to the northwest, passed along the foot of Khirbat ‘Addasah (Survey of Jerusalem, the Northeastern Sector, Sites 4, 5) and continued in the direction of Bir Nabalah and Giv‘at Ze’ev near Khirbat el-Latatin and from there in the direction of Lod and on to Yafo. The third road segment exposed in the excavation was oriented east–west; it was built differently than the two other uncovered road segments. 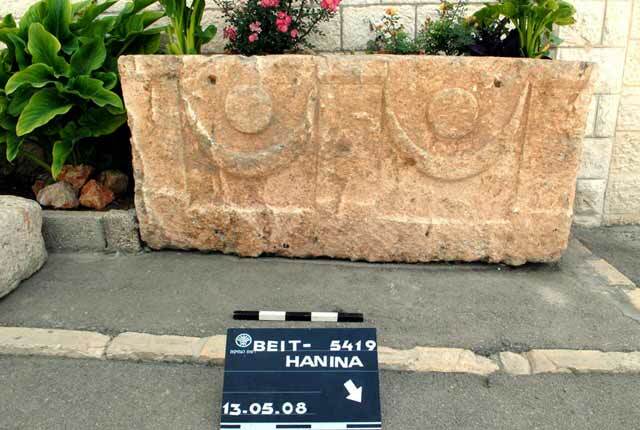 It seems that this segment was part of an interior road that ran from Bidu–Beit Liqiya–Lod. This road also branched off from the Jerusalem–Nablus longitudinal road along the hill country in the region of Tell el-Ful (Giv‘at Sha’ul) and turned west toward Beit Hanina. It continued toward the southern slopes of Har Shmuel—Nebi Samwil—and from there to Bidu and on to Lod (I. Roll. 1987. Modes of Tranportation from Yafo to Jerusalem in the Roman and Byzantine Periods. In E. Shiller, ed. Sefer Ze’ev Vilany. Vol. 2. Jerusalem. P. 126 [Hebrew]). 2. Remains of an ancient road, looking northwest. 3. Area A, plan and sections. 4. Area A, Farming Terrace 2, looking west. 5. Area A, Farming Terrace 6, looking west. 6. Area A, an ancient road, Phase 1, looking south. 7. Area A, an ancient road, Phase 2, looking south. 8. Pottery from the Byzantine period. 9. Pottery from the Iron Age and the Herodian and Roman periods. 10. Area A, an ancient road, Phase 7, looking north. 11. Area B, plan and sections. 12. Area B, an east–west aligned road, looking west. 13. Pottery from the second century CE. 14. Pottery from the second to the mid-fourth centuries CE. 15. Two silver Roman republican coins. 16. Pottery and stone vessels from the Hellenistic and Herodian periods. 17. Pottery from the Byzantine and Early Islamic periods. 18. Area B, a north–south aligned road, looking east. 19. Cross-section of the bathhouse colonnettes. 20. The bathhouse remains, looking west.